At the January 14, 2012, meeting at the Williamston Depot Museum in Williamston, the MARP Executive Committee approved the attached Route Enhancement Recommendations. We are asking all members to review these recommendations and help us keep abreast of the many wonderful projects underway in Michigan. We particularly need volunteers to help us track what is happening in Battle Creek, Troy and the proposed improvements between Porter, Indiana, and Chicago Union Station. a) Track status of implementation on a monthly basis. b) Determine funding needed if PRIAA is implemented. c) Establish communication links with MDOT, Amtrak, rail advocacy groups in affected states, & federal legislators to develop a unified position on actions needed, including rescinding of Section 209.
d) Investigate options to offset costs of PRIIA including extension of trains to Canada, the Eastern United States or points beyond Chicago on the West. Initiate commuter rail service between Ann Arbor and Detroit and between Howell and Ann Arbor (WALLY). Consider extension of WALLY to Durand and Flint. a) Work with TRU and other advocacy groups for the establishment of a Southeast Michigan Transportation Authority. b) Find champions at the local, state and federal levels who will push for implementation of local commuter services. c) Facilitate a steering group including business, community, advocacy and political leaders to educate the public on the value of commuter service and market the service. d) Hold demonstration runs in 2012. Initiate Community Benefit Studies to determine the possibilities of additional service on the Pere Marquette and Blue Water routes including the possibility of combining the two routes. Include in these studies additional Wolverine service between Battle Creek and Chicago. a) Work with MEC and TRANS4M to identify a funding source for these studies. c) Select a consulting firm to conduct the studies, possibly the one that did the Grand Valley study. d) Review and approve findings. e) Communicate findings to affected communities, MDOT and the Michigan legislature. Assure an adequate level of funding for replacement of intercity motor coaches. a) Meet with Indian Trails and other intercity carriers to identify needs. b) Involve other advocacy groups including TRANS4M, MDOT and members of the Michigan legislature to secure an adequate level of funding. c) Track expenditures once funding is secured. Ensure progress on all approved projects including MDOT acquisition of the Dearborn-Kalamazoo line and its upgrade to 110 mph speed, Amtrak upgrades Kalamazoo-Porter, the West Detroit Connector, CREATE, Indiana Gateway, purchase of new rolling stock, and station projects in Grand Rapids, Battle Creek, Jackson, Ann Arbor, Dearborn and Troy. a) Report quarterly to the Executive Committee. b) Demand explanations and corrective actions if projects fall behind schedule. Push for genuine connectivity between intercity bus and rail service in Michigan. a) Work with Indian Trails, MDOT, and Amtrak to identify and overcome obstacles to having all Indian Trails routes in Michigan identified as Amtrak Thruway Routes. b) Identify funding required to institute new intercity motor coach routes including north from New Buffalo along the Lake Michigan shoreline and daytime service Marquette-Milwaukee. c) Create website page with information about how to get around Michigan by train and bus. a) Determine the level of funding needed for an adequate passenger rail system in Michigan. b) Support TRANS4M in its efforts to secure adequate funding for all transportation modes. c) Enlist all transportation and environmental groups in advocating for a balanced transportation system in Michigan. d) Insist that a full 10% of transportation funding be dedicated to public transportation including rail as specified by the Michigan Constitution. e) If passenger rail funding remains inadequate even with 10% of the state transportation funding dedicated to public transportation, identify additional funding possibilities. There are a lot of conflicting statistics being thrown around in the debate taking place over what direction the U.S. transportation should take. NARP has done the work to defend passenger trains against the half-truths and flat-out inaccuracies being used by anti-rail groups. Any myths you’d like to see debunked? Any facts that sound fishy to you that you’d like NARP staff to investigate? If there are any additions or alterations you’d like to see to this document, simply email [narp]@[narprail.org] with your suggestions (Subject: Myths & Facts). Myth: Unlike Europe, the US doesn’t have the population density to support high-speed rail, and can’t support passenger trains outside the Northeast Corridor. Fact: The US population is actually clustered within megaregions: the Northeast, Midwest, Southeast, and California—precisely the areas where most high-speed and intercity passenger rail projects are advancing. It’s treated as a given that the Midwest is too sparsely populated to consider passenger train investment. However, the Midwest Megaregion (a region roughly bounded by Ohio, Missouri, Minnesota, and Michigan) encompasses a $2.6 trillion economy—the fifth largest in the world, behind only the U.S. itself, China, Japan, and Germany. California—currently designing and engineering a statewide high-speed rail network—compares favorably to Spain in terms of density with 88.1 people per square mile to Spain’s 89.6. And California beats Spain’s economic output with a per capita GDP of $49,894 to Spain’s $36,451. 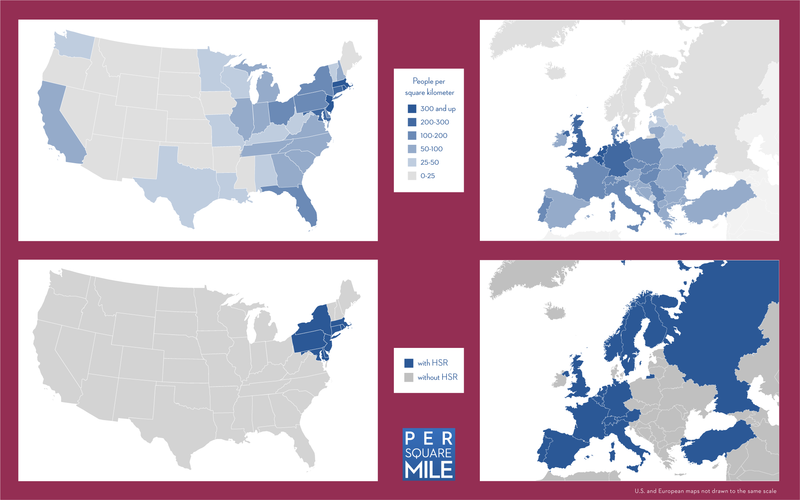 Image: Per Square Mile compares U.S. and European density. With 130 million additional Americans expected by the year 2050, investing in rail lines to accommodate this growth will determine whether we are faced almost exclusively with sprawling, road-dependant suburbs or will the universe of livable, navigable communities grow substantially. Fact: Amtrak is 31.2% more efficient than automobiles, 33.5 % more efficient than personal trucks, and 13.8% more efficient than airplanes (on a Btu per passenger mile basis). And the U.S. saves 4.2 billion gallons of oil each year through the use of public transportation. To get a more complete picture of the environmental impact of rail transit of all forms, one must take into account the extent to which rail serves as a catalyst for energy-efficient, pedestrian-friendly real estate development and thus also energy-efficient buildings. Fact: Amtrak’s long-distance trains provide service to many communities with few-to-no alternatives, and long-distance coach passengers are the lowest-income segment of Amtrak’s markets. The Empire Builder alone carried 533,000 passengers in fiscal year 2010. The route has very limited bus and air service alternatives and no parallel interstate highway most of the way. Extreme winter weather conditions frequently close highways and airports. Senior citizens accounted for 38% of adult passengers on the long-distance trains in FY2010. Of all Amtrak riders requiring accessibility, 42% use the long-distance trains. Paying to provide highway and air alternatives for these special-needs populations would be far more expensive than maintaining Amtrak service. Myth: The taxpayers pay Amtrak subsidies because the railroad loses so much on sleeper rooms and dining service. Fact: Sleeping car passengers pay much higher fares than other passengers. Though they account for only 15% of long-distance riders, they are the source for 36% of the total revenue. Since the average coach traveler rides for more than 10 hours, providing access to food is essential for a functioning train service. Amtrak has simplified its offerings and implemented point-of-sale systems to enhance cost efficiencies. Fact: The amount that government has spent on highways, roads, and streets has exceeded the amount raised through gasoline taxes and other user fees by $600 billion (in 2005 dollars). Since 2008, Congress has transferred $34.5 billion in U.S. Treasury general funds to the highway trust fund. Generally, highways cover only 51% of the total associated costs through user-fees, because the federal highway program focuses on new-build and leaves states to worry about maintenance. Compare that to the 75% of Amtrak operating costs and 53% of commuter rail operating costs covered by ticket revenues. Myth: The only way to decrease traffic is to build more roads. Fact: A recent study by the University of Toronto found that building more roads leads to more congestion. As you increase capacity, new drivers will move in to take up that freed capacity until traffic becomes so onerous that people look for other alternatives. The equilibrium point for urban roads will always be congestion. “In particular, if you had one percent more roads, you had one percent more driving in those cities” says Matthew Turner, a co-author of the study. The only method known to effectively decrease traffic is congestion pricing, where drivers are charged on a variable scale based on zone and time (i.e. driving downtown during rush hour will be the most expensive). Fact: An initiative is a ballot measure placed on the ballot by the voters. In truth, the California high-speed rail project measure was placed on the ballot by a two-thirds vote in both houses of the Legislature and granted final approval by the (Republican) Governor, pursuant to the constitutional requirement for approval of general obligation bond measures. And as of this summer, the low-end estimate for the entire San Francisco-Los Angeles-Anaheim route has only been increased by $3 billion from the 2009 estimate of $43 billion. Myth: High-speed rail in California will destroy huge amounts of farmland and lead to urban sprawl. Fact: California is projected to add around 25 million people by the year 2050, bringing its total population to around 60 million people. If the state didn’t build the high-speed line, transportation officials estimate California would need to spend an estimated $100 billion on 3,000 miles of new freeways, five new airport runways, and build 90 new departure gates through airport expansion or new construction. Modern rail corridors are actually the cheapest, most land-efficient way to accommodate all the traveling Americans will need to do in the coming century. By creating hubs for intercity transportation in city- and town-centers, passenger trains create denser, safer, more pedestrian-friendly communities for families. Fact: The state of California’s GDP is $2 trillion. The United State’s GDP is around $14 trillion. The money we are spending on high-speed rail—and even the total cost of the project in California—is a tiny fraction of that. And a drop in the bucket compared to the hundreds of billions the U.S. spends on roads and highways. Additionally, the funds are not interchangeable. This claim is often made by people who want to see Amtrak and high-speed rail killed, knowing that once the money is rescinded there’s little chance that Congress would redirect the money to increase spending on transit. By ignoring intercity transportation we would be chaining ourselves to automobiles, freeways, and airplanes—dramatically increasing our energy consumption and CO2 emissions. America needs both intercity rail and intracity transit. The U.S. invests about 2.4% of GDP on transportation and water infrastructure. Europe invests 5% of its GDP by comparison, with China sprinting ahead at 9%. It’s no wonder that American Society of Civil Engineers’ 2009 Report Card for America’s Infrastructure graded the nation’s critical infrastructure systems a “D”, noting a five-year investment need of $2.2 trillion to bring U.S. infrastructure up to par. In June 2010, Michigan Environmental Council (MEC) and the Michigan Association of Railroad Passengers (MARP) convened a series of statewide public forums focused on Michigan’s rail system. Sixteen Michigan By Rail public forums were held across the state during the summer and fall. This summary of Michigan By Rail findings provides a brief overview of the Michigan By Rail public forums, a discussion of the five common themes that emerged through each forum, a description of each of the forums including promotional materials, sample press materials and sample maps from each forum that best represent the general direction of that particular forum. The purpose of the Michigan By Rail public forums was to begin a statewide conversation about Michigan’s passenger rail system, to better understand what Michiganders want out of the state’s passenger rail system, and to encourage citizens to submit their ideas to the Michigan Department of Transportation for incorporation into the official State Rail Plan. The forums took place on weekday evenings and were primarily participant-driven. They began with opening remarks which included an explanation of Michigan By Rail public forums and the State Rail Plan. MEC and MARP clearly distinguished Michigan By Rail public forums from the transportation department’s four listening sessions. Short introductions of the sponsors, local partners, and elected-official hosts followed the opening remarks. Three United States congressmen, twenty-five state legislators, more than twelve mayors, and numerous city council members and township officials hosted the events. Over 100 local partners, including more than 40 municipalities, eighteen chambers of commerce, seven planning departments, six conventions and visitors’ bureaus, and many others, helped publicize the forums. Roughly 1,100 citizens participated. Interactive mapping sessions consumed the majority of the forums. Participants clustered around tables in groups of about ten. The participants were given large Michigan maps which contained only county lines. The participants were instructed to first place a sticker on the map which indicated where they considered home. Then, they placed another sticker on the map at a place that they considered to be important to the state — a natural area, culturally significant place, etc. Some participants used more than one sticker. They were then instructed to draw lines on the map where they would like to travel by passenger train. They also were reminded to consider freight rail traffic. Finally, a person from each table presented that table’s map to the group at large — summaries of discussions, an explanation of what they drew on the map, and so on. The full group had the opportunity to question and comment on each map. A representative from Amtrak or the Michigan Association of Railroad Passengers explained Michigan’s current passenger rail system after the map presentations. The overview of the current system was intentionally delayed until after each table presented its map so as not to influence the mapping session. The system overview led into wide-ranging discussions that consumed the remainder of the forum. The discussions varied from forum to forum based on participant interest. Common themes emerged both in the discussions and written input submitted by participants. MEC and MARP collected input from participants about the current passenger rail system and their visions for its future. Participants’ comments and the maps they created were used in the preparation of this document. Michigan’s passenger rail system should include a Traverse City to southern Michigan connection. Michigan’s passenger rail system should connect east Michigan to west Michigan. Michigan’s passenger rail system should connect Michigan’s universities. Michigan’s passenger rail system should include commuter rail connections. Michigan’s passenger rail system should connect to Toledo. What follows is a brief discussion of each of the common themes. Each map at each forum included connecting Traverse City to the southern part of the state in some fashion. The southern connection points varied between Grand Rapids and the Ann Arbor area depending on where the forum was held. The maps, discussion, and comments, however, were consistent across forums regarding a Traverse City to southern Michigan passenger rail connection. Almost every map included connecting Michigan’s east side to west side from Detroit to Lansing to Grand Rapids (and often Holland). Discussions around this passenger rail connection focused on linking together Michigan’s three principal cities (without first traveling to Chicago); commuter possibilities; connecting two major universities, Michigan State University and Wayne State University; make doing business easier in the three cities; and tourist travel — sports venues in Detroit, Art Prize in Grand Rapids, and the Capitol and other state government interests in Lansing. Participants consistently mentioned a desire to connect Michigan’s universities and colleges. Some Michigan college towns are currently served by Amtrak; increasing service frequency, re-scheduling to accommodate the academic calendar, and connecting the college and universities together were reoccurring points. The rationale that surfaced most typically in connecting the state’s academic institutions was to allow for instructors and students to more easily work and study at more than one institution. Participants at each forum discussed the need for some sort of commuter rail service connecting the principal cities to outlying areas, particularly Detroit, Ann Arbor, Flint and Grand Rapids. These discussions included a direct rail connection to Detroit Metropolitan Wayne County Airport (DTW). Connecting Michigan’s existing passenger rail system to Toledo came up at each forum. Participants discussed that one must travel to Chicago — or by motor coach to Toledo — to travel to points east such as New York. Connecting Toledo to the Wolverine at Ann Arbor or Detroit was typically suggested. More information, including photos of all of the participant-created maps, as well as local news articles covering many of the forums, is available at www.michiganbyrail.org. Bay County voters were asked to approve a five-year, 0.75-mill renewal for operations of the Bay Metropolitan Transportation Authority. The renewal is expected to generate about $2.2 million a year. The rate has not increased since it was first approved by voters in 1981. The revenue is used to match state and federal grants, which all totaled fund Bay Metro’s $7 million annual budget. Voters are being asked to approve a 0.15-mil levy, which will run for four years, for the purpose of providing public transportation within Bennington Township from SATA at a reduced cost. If approved, the millage would raise an estimated $14,400 in its first year. Voters were asked to approve a 0.35 millage renewal to support the operation of the Branch Area Transit Authority (BATA) bus service. Local voters have always approved renewals. The tax will continue until 2014, and is expected to raise about $464,770 in its first year. Voters were asked to approve a five-year millage renewal for Clare County Transit Corportation. The total request was for 0.3 mills, with 0.2953 mills being renewed and 0.0047 mills being restored. The tax was originally approved in the 1980s. It is estimated to generate $312,068.00 the first year. Clare County Transit has an annual operating budget of approximately $1.2 million. Funding comes from the local millage, fares and state and federal grants. Voters in Almer Charter and Indianfields townships and the City of Caro were asked for 1 mill for three years for the Caro Transit Authority to operate Thumbody Express. The measure is expected to generate $231,000 annually. Voters in Eaton County were asked to increase the millage for EATRAN to 0.5 mill to allow service expansion and some fixed-route service. A measure identical to the failed August 3 measure. The proposal would replace the 0.2469 mill levy with an 0.75 mill tax levy for five years, from 2012 through 2016. The county Board of Commissioners voted to put this measure back on the ballot two weeks after the disappointing August election. On the ballot was a five-year renewal measure for a 0.4 mill tax to support the Mass Transportation Authority’s countywide bus system. In its first year, the tax is expected to generate about $4.5 million. Countywide property taxes have been approved for MTA everytime they have been on the ballot since 1996. The proposal would combine and reauthorize two levies approved by voters in 2004 and 2006 for public transportation services elderly and disabled. The 0.48 mill would raise approximately $3.641 million a year. This measure for the Capital Area Transportation Authority would replace replace two existing levies with a single renewal and an increase totalling 3 mills. This rate was approved by voters in 2004, but was subsequently reduced by a change in a constitutional provision. The millage is expected to generate approximately $18,001,980 in its first year. This proposal asks voters to renew the 0.25 operating fund millage for the Greater Lapeer Transportation Authority. It was approved by voters in 2006 and was set to expire in 2010. It will be applicable in the townships of Deerfield, Elba, Lapeer, Mayfield, and Oregon and the City of Lapeer, for a period of five years, from 2011 to 2015. It is estimated to raise $290,000 in its first year. This proposal asked voters to renew the 1 mill operating fund millage for the Ludington Mass Transportation Authority that was approved in 2006 for four years. The tax would be extended for five years, from 2011-2015 in the city of Ludington. In its first year it is estimated to generate $262,945. This proposal asked voters to renew the 1 mill operating fund millage for the Ludington Mass Transportation Authority that was approved for 2 years in 2008. The millage would be levied for five years, from 2011-2015 in the city of Scottsville. In its first year it is expected to generate $23,460. The measure asked voters to approve a 3-mill, five-year renewal of the levy for the Saginaw Transit Authority Regional Services. The measure is necessary to maintain operations in preparation for a potential countywide measure in 2015. Voters will consider a two-year renewal of 0.9898 mills to pay for the village’s participation in the Harbor Transit transportation system. The levy would be within the village’s authorized operating tax, and would not involve a change in its millage rate. It is expected to generate $84,786 annually. St. Joseph County voters in August will get a request to renew for four years a 0.33-mill property tax originally approved in 2007. The tax generates $583,000, about 45 percent of the St. Joseph County Transportation Authority’s $1.3 million budget. It is set to expire next year. Request to renew 0.2480 mill for public transportation services for seniors and disabled people for 5 years, from 2011-2015.. The levy is expected to bring in $734,431 in the first year. Voters in Wayne, Oakland and Macomb counties voted on a two-year millage renewal to fund local SMART bus service in their communities. The 0.59-mill property tax funds bus service in the 23 suburban communities that have chosen to “opt in” to the system by voting on the tax. SMART gets about half its revenue from property taxes, and has recently trimmed $11 million from its budget — $7 million through cuts and $4 million through a fare increase that took effect Dec. 1. This proposal asked voters countywide to consider a 0.6 mill levy to support operations for the Cadillac/ Wexford Transit Authority. The levy would be renewed for four years. The CWTA had $2 million in total expenses in 2009. This operating millage is expected to generate $591,285. City of Ypsilanti voters were asked to approve a charter amendment to levy an additional 0.9789 mills specifically for public transit, restoring the original 20 mills that had been reduced. With the amendment in place, Ypsilanti would secure an additional $281,429 in revenue in 2011 for bus transportation through the Ann Arbor Transportation Authority. Amtrak has issued it’s annual fact sheet for the State of Michigan for fiscal year 2009. Click here to read the report in it’s original form.